ADAM DAY WAS DISCHARGED FROM THE SERVICE BECAUSE OF DISABILITY ON 21 FEBRUARY 1862. IN 1939 THE INDIANA AMERICAN LEGION AND THE WORKS PROJECT ADMINISTRATION DOCUMENTED MANY OF THE VETERANS BURIED IN INDIANA. BELOW IS THEIR WORK SHOWING ADAM DAY BURIED IN THE MT. PLEASANT CEMETERY THAT IS LOCATED IN DELAWARE COUNTY INDIANA. ADAM DAY MARRIED SARAH A. BRAILEY IN SEPTEMBER OF 1857. BY AUGUST OF 1865 SARA MARRIED GEORGE W. VICKROY IN DELAWARE COUNTY SUGGESTING THAT ADAM HAD PASSED AWAY SHORTLEY AFTER COMING HOME IN 1862. A SEARCH OF THE MT. PLEASANT CEMETERY REVEALED NO HEADSTONE FOR ADAM. CHANCES ARE HE IS BURIED THERE IN A UNMARKED GRAVE. 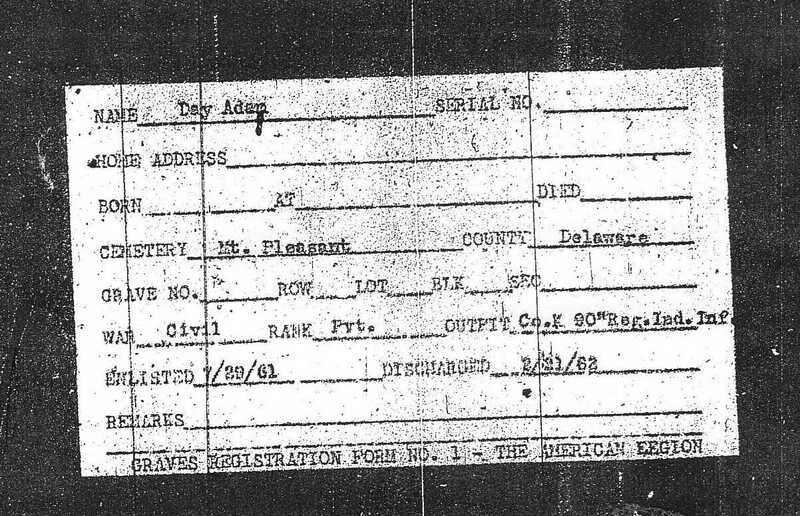 THE AMERICAN LEGION BURIAL RECORDS HAVE ON A FEW OCCASIONS BEEN FOUND TO BE INCORRECT. BECAUSE OF THIS IT CAN NOT BE SAID FOR CERTAIN THAT ADAM DAY IS BURIED IN THIS CEMETERY.